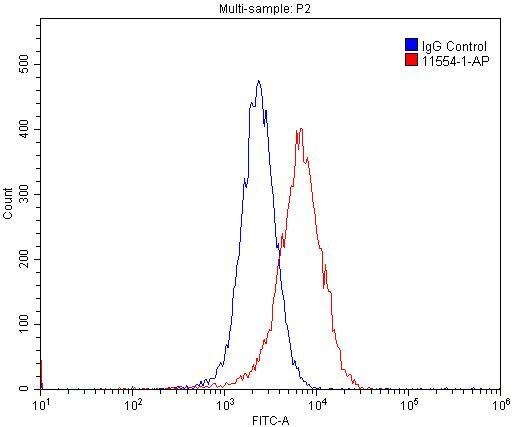 1X10^6 MCF-7 cells were stained with 0.2ug Cyclin E1 antibody (11554-1-AP, red) and control antibody (blue). Fixed with 4% PFA blocked with 3% BSA (30 min). Alexa Fluor 488-conjugated AffiniPure Goat Anti-Rabbit IgG(H+L) with dilution 1:1500. Cyclin E1 (CCNE1) is a member of the highly conserved cyclin family, whose members are characterized by a dramatic periodicity in protein abundance through the cell cycle. CCNE1, an essential cyclin activating Cdk2, regulates the G1-S phase transition of the mammalian cell division cycle. Its timing expression plays a direct role in the initiation of DNA replication , the control of histone biosynthesis, and the centrosome cycle. CCNE1 is associated with disease progression in various malignancies and is associated clinically with poor prognosis. CAPE-pNO2ameliorated diabetic nephropathy through regulating the Akt/NF-κB/ iNOS pathway in STZ-induced diabetic mice. Actin-capping protein CapG is associated with prognosis, proliferation and metastasis in human glioma. Arachidonic acid induces macrophage cell cycle arrest through the JNK signaling pathway. Mitochondrial cytochrome P450 (CYP) 1B1 is responsible for melatonin-induced apoptosis in neural cancer cells.